Home of the Wise Owls! Join the PTA for an adult-only evening with food and beverage (age 21 and over ONLY) and bid on some amazing auction items to support Shrevewood! We have exercise memberships, sports tickets, concert tickets, signed sports memorabilia, restaurant gift cards, and lots more! Buy tickets online today! Registration hours are: 10:00 a.m. to 3:00 p.m. please call ahead. School begins at 9:20 a.m. Students can not be dropped off before 9:05 a.m.
School dismisses at 4:05 p.m. and if you are picking up students early, it must be before 3:30 p.m.
View frequently accessed student resources! 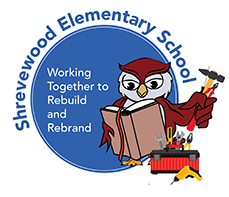 Learn about the Shrevewood PTA! See what's happened at Shrevewood this winter. Dr. Scott Brabrand, Superintendent of Schools, had an opportunity to experience Math Workshop in a classroom of first and second graders at Shrevewood Elementary! Mr. Hearin, Mrs. Rodriguez, and Mrs. Buchanan Recognized at FCPS Honors! Congratulations to Third Grade Teacher Thomas Hearin, Fourth Grade Teacher Nikki Rodriguez, Student Information Assistant Jennifer Buchanan who were recognized at the 2018 FCPS Honors Ceremony! Need to do some research?